Now I pull to open, and push to close. It works very well. This gadget is very lightweight, separates for easy storage, and can be used for multiple purposes. It took me ten minutes to complete this modification and cost me $10 for the cleaning kit. In my opinion, the skill level of this modification is very easy. After a day of driving, I would find an entire roll of paper towels on the floor. 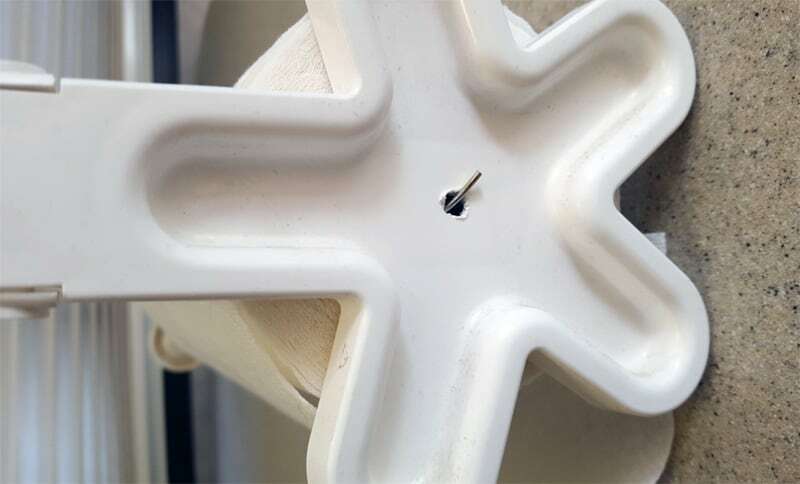 The paper towel holder is a plastic wall-mount holder designed for RVs. 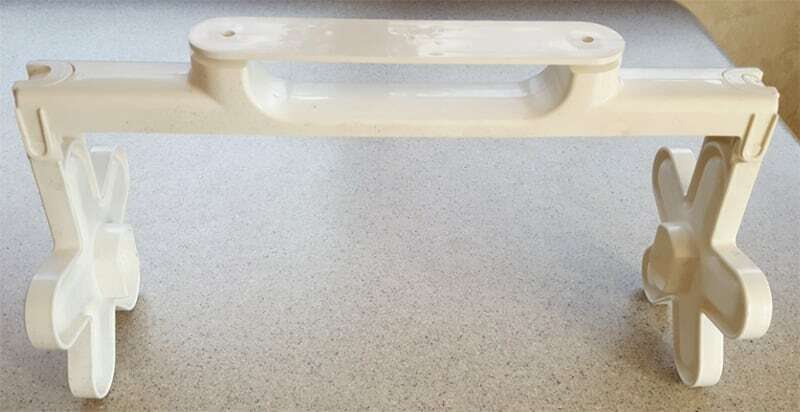 It can be removed by sliding it off the base that is screwed to the wall. To fix the problem, I drilled a small hole on the center of each end of the holder. This hole corresponds to where the power towel tube sets. 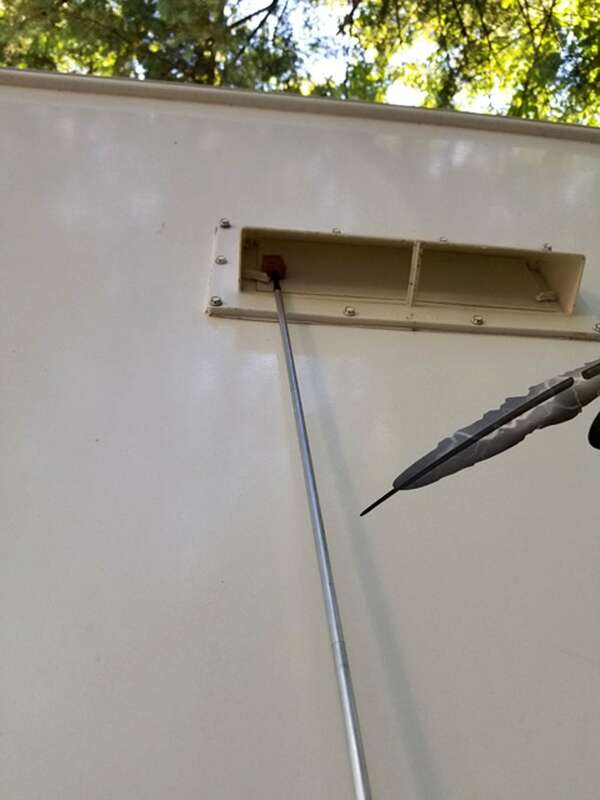 The I took a small bungee cord and bent the hooks on each end at a 90-degree angle. 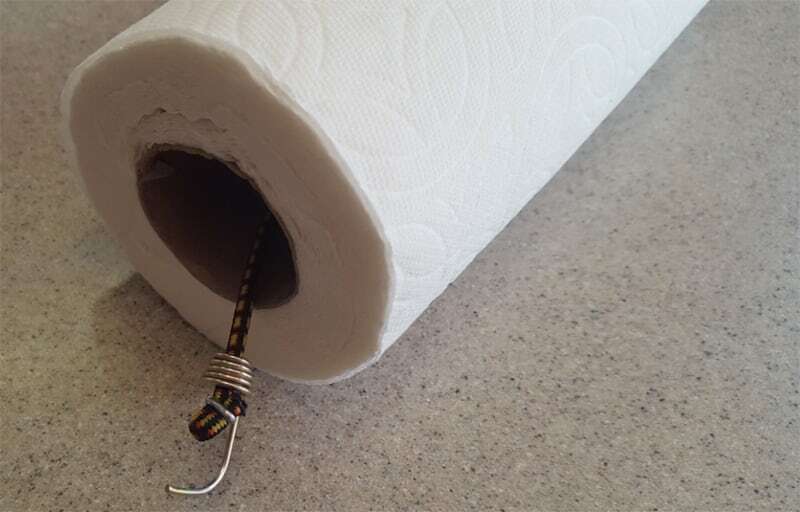 I thread the bungee cord through the paper towel’s cardboard tube and hook the bungee to the holes drilled in each end. 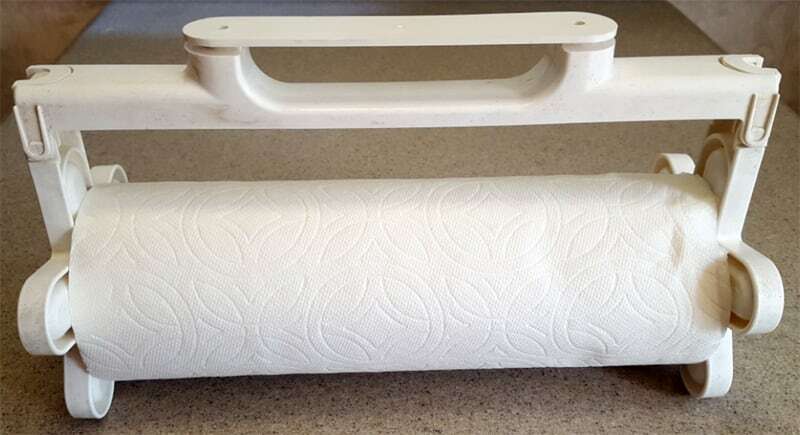 This puts tension on the sides of the paper towel roll so that it won’t unroll while driving. The length of the bungee can be adjusted for the proper amount of tension so the roll will still turn when pulling on the roll to tear off a towel. It also prevents the entire roll from being on the floor when you arrive at your campsite. The mod has work great! Since I completed this mod, a paper towel roll has never unrolled or hit the floor while traveling. It took me one hour to complete this modification and cost me $2.00. In my opinion, the skill level of this modification is easy. 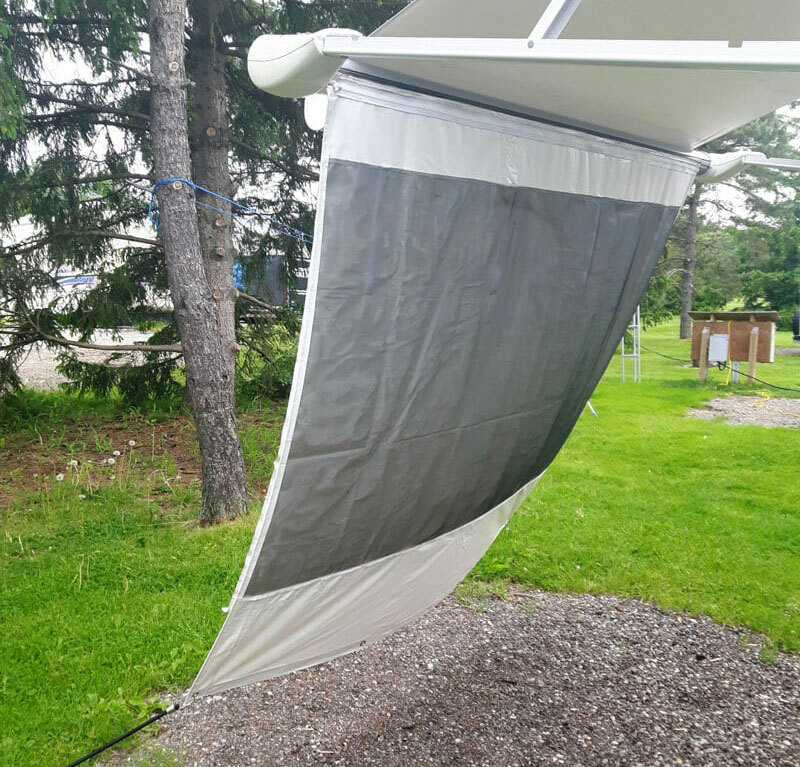 We wanted to get a little more area out of our rear power awning to be covered, but still have the breezy option available. 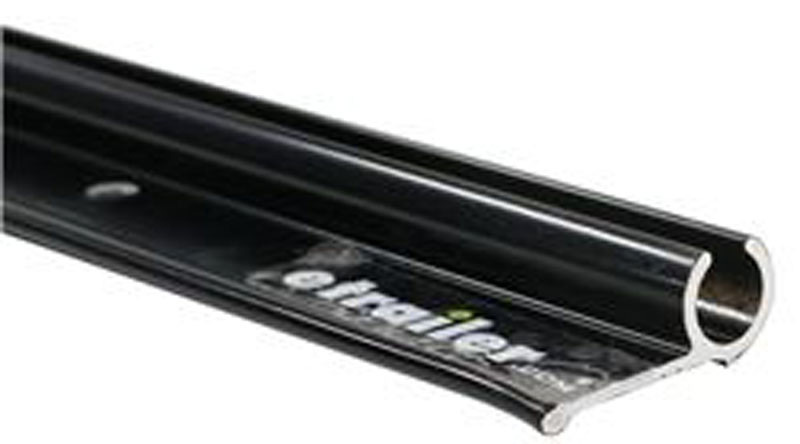 We had a custom zippered tarp made that slides into the extra slot in the awning roller tube.